Maiden Lane Press, 9781940210001, 400pp. When Helen Honeycutt falls in love with Emmet Justice, a charismatic television journalist who has recently lost his wife in a tragic accident, their sudden marriage creates a rift between her new husband and his oldest friends, who resent Helen's intrusion into their tightly knit circle. Hoping to mend fences, the newlyweds join the group for a summer at his late wife's family home in the beautiful Blue Ridge Mountains. Helen soon falls under the spell not only of the little mountain town and its inhabitants, but also of Moonrise, her predecessor's Victorian mansion, named for its unique but now sadly neglected nocturnal gardens. But the harder Helen tries to fit in, the more obvious it is that she will never measure up to the woman she replaced. Someone is clearly determined to drive her away, but who wants her gone, and why? As Emmet grows more remote, Helen reaches out to the others in the group, only to find that she can't trust anyone. When she stumbles on the secret behind her predecessor's untimely death, Helen must decide if she can ever trust--or love--again. CASSANDRA KING, who has been called "the Queen of Southern storytelling," is the author of four novels, " Making Waves, The Sunday Wife, The Same Sweet Girls "and "Queen of Broken Hearts," as well as numerous short stories, essays and articles." Moonrise," her fifth novel, is set in Highlands, North Carolina. A native of Alabama, Cassandra resides in Beaufort, South Carolina, with her husband, writer Pat Conroy. “...A suspenseful Gothic that gives a nod to its predecessors while still being fresh." 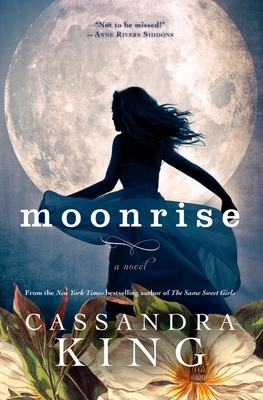 “Moonrise is a fantastic, not-to-be-missed novel." "I read Moonrise in a single greedy gulp. Moonrise [is] a satisfying ghost story that is also a thoughtful examination of obsession, love, and the space where the two meet." "Moonrise is a beautifully written, fast-paced novel that clearly comes from the pen of a fine southern storyteller, her finest book to date."